With it being a busy week ahead – as I have already mentioned it is the Fowey Royal Regatta – I wanted to make something sweet for a quick energy burst, but also something easy to make and pack into tins to take to the various great events that the week offers. 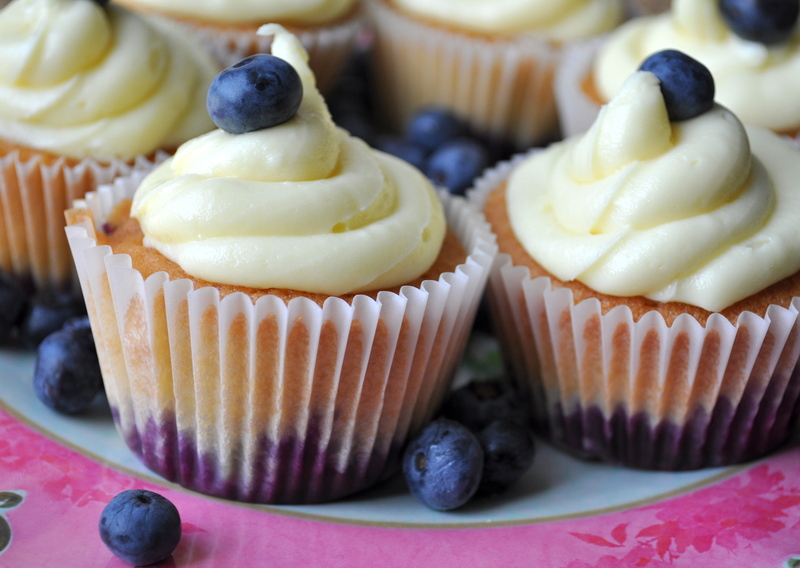 And with some blueberries already in the fridge and cupcake lovers in the house, blueberry cupcakes sprang to mind with a luxurious topping of white chocolate butter cream to satisfy the party-time spirit. There is no slicing with cupcakes too; so, simply grab, peel back the wrapper and party! Pre-heat the oven to 180°C (fan 160°C) mark 4. Place one muffin case into each of the muffin tin holes and set aside. In a large bowl whisk together the sugar, butter, flour, eggs, baking powder and essence with an electric mixer. (If you are doing it by hand then beat the sugar and butter together until light, then beat in the eggs a little at a time. When all the eggs have been used, stir in the flour, baking powder and essence.) Finally, stir in most of the blueberries, retaining a few for decoration. Divide the mixture between the muffin cases. Place in the pre-heated oven and bake for approx. 20-25 minutes until the cakes are springy to the touch and an inserted skewer comes out clean. 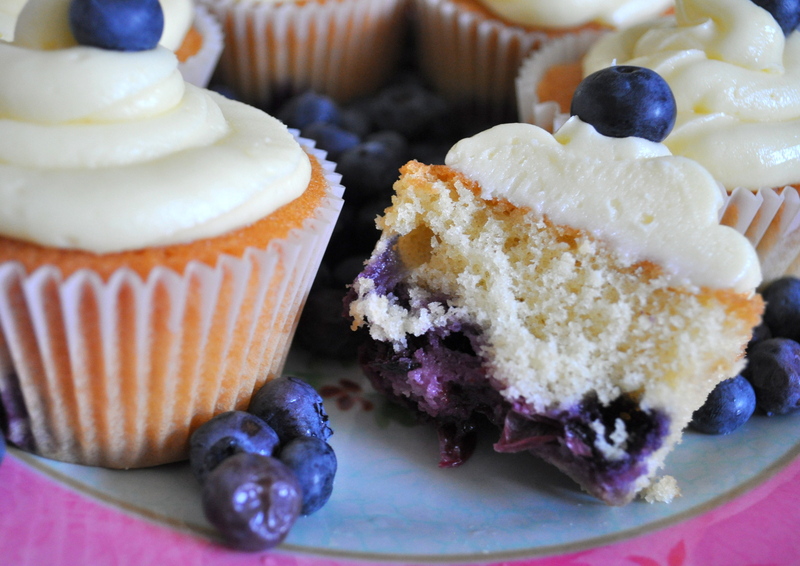 It is most likely that the blueberries will sink to the bottom of the cakes – this is fine and creates a lovely jammy base. Set aside to cool. Break the white chocolate into chunks into a heat proof bowl. Place this over a saucepan of gently simmering water until the chocolate has melted. Remove from the heat and allow to cool slightly. In the meantime, in another bowl beat together the butter and icing sugar until thoroughly mixed and soft. Add the cream and melted white chocolate and mix until a soft butter cream. Spoon this mixture into a piping bag or tube and with a smooth edged nozzle pipe swirls on top of the cakes. 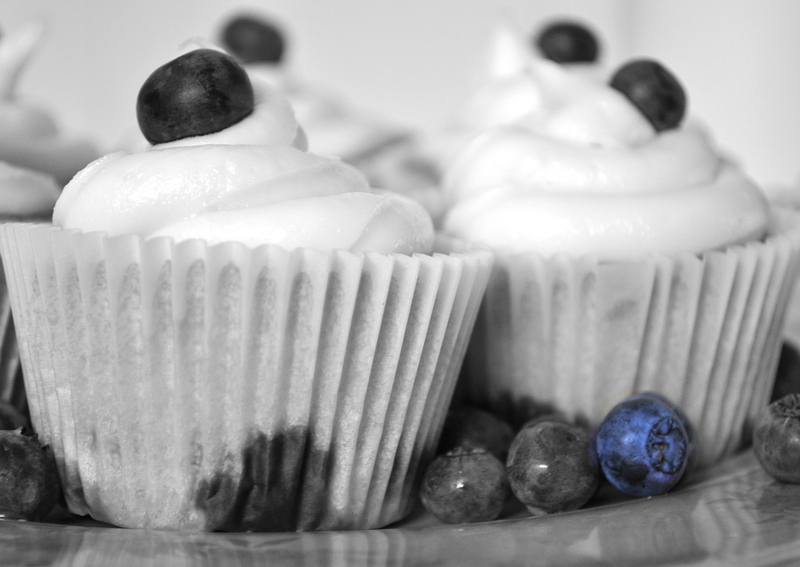 Top each with a blueberry and serve, or pack and take to your special event or day out – happy eating! They are best eaten within 3-4 days, if they last that long! I may not get the chance to write again this week as the Regatta not only keeps us busy with social activities but it is the busiest week of the year on our campsite. But I will catch up with you as soon as I can when the excitement all calms. 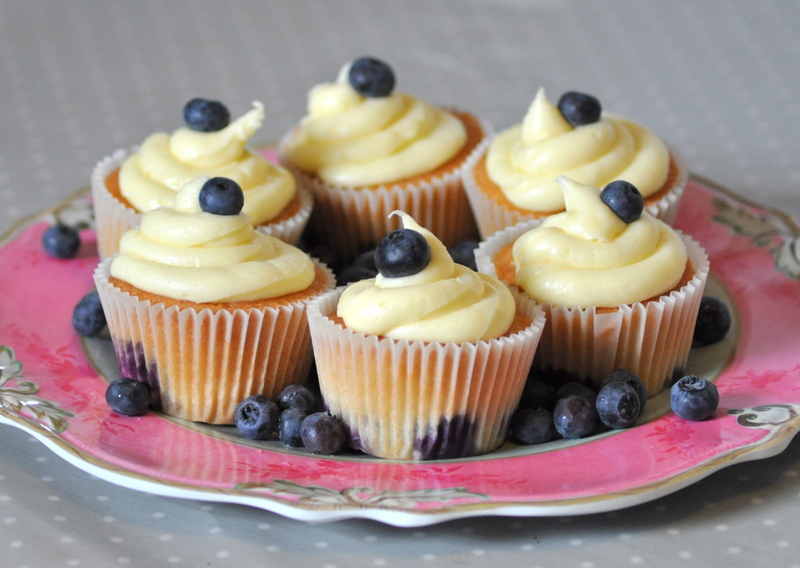 Blueberry cupcakes with white chocolate cream swirls – great for all occasions! My name is Diane Whalley. 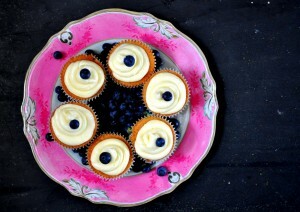 I'm a designer/artist, cook, mother of 2 daughters and founder of pictures and patisserie. We live in a farmhouse in the English countryside, walking distance from the Cornish coast. 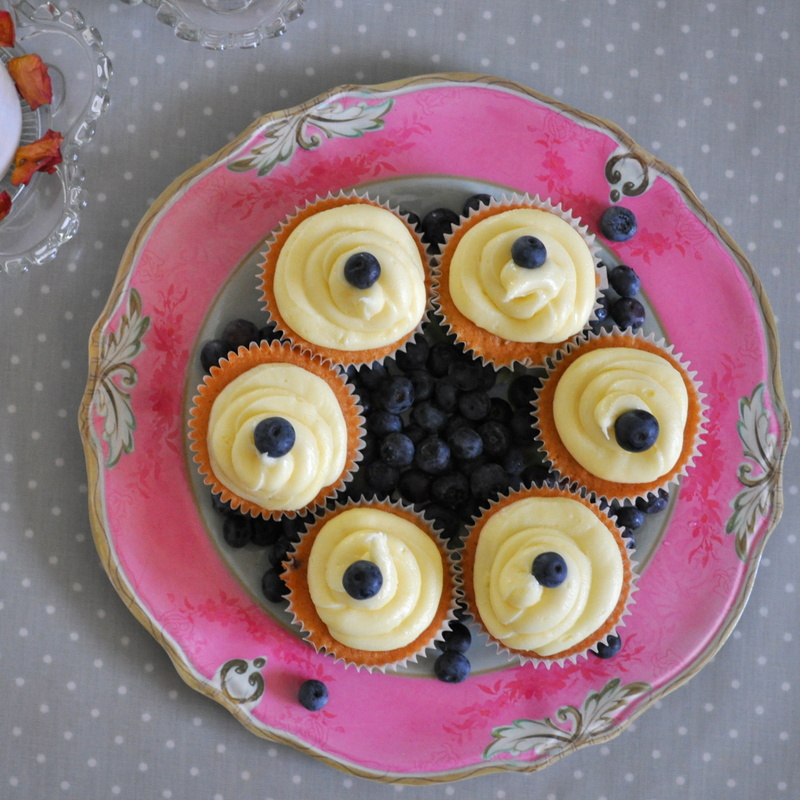 I blog about all things design, baking and family related - all things that make a home.